It doesn't look good for meeting my two walks per weekend goal. Mowing killed my Saturday by incapacitating me with a headache. Sunday found me hiking early in the morning before the worst of the heat. The bugs tried their best to eat me alive. Next time I will wear a hat and more bug spray. Unfortunately, it rained or threatened rain all day today. I watched a lot of TV, did a very small amount of picking up, and then hit Target to kill the stir crazies. I tried out every piece of lawn furniture they sell, but limited my purchases to cleaning supplies and paper products. Then I went window shopping at a couple garden centers. I want to plant everything that flowers. My yard needs so much work though that I know I should probably wait until I come up with a plan. My tendency to plop things in the ground all willy-nilly may not be the best solution to an already challenging situation. Plus, whatever I plant may run the risk of getting damaged by Contractor #2 when he's working on the trim and siding. One of the things I almost bought today was a huge cluster of Sedum autumn joy. It looked so lush and I like the idea of planning for some color for the fall as well. Maybe I'll go back. One new plant can't hurt, right? Ah, yes, we have some of that. 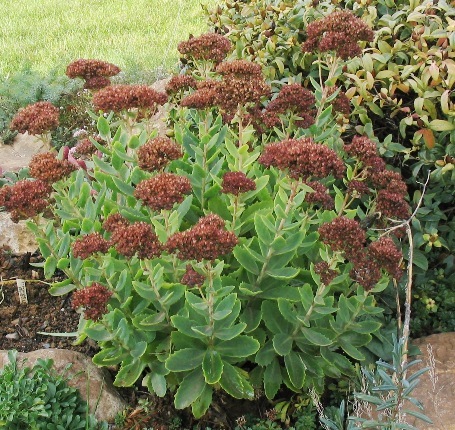 Or some variety of fall-blooming Sedum anyway. I think ours is a little pinker. At least I am wearing a low cut shirt. Those napkins should come with a warning. I should have taken a picture of the stairs.